Bangor University has been placed in the 100 top universities in the world in a new table listing the most international universities worldwide, published by the Times Higher magazine. The ranking lists international universities which are the most global in their outlook. Bangor University is ranked 90th in the world in this table. It is the only Welsh university to appear in the top 100. The table reflects both the global reach of the university in terms of its reputation and research and its appeal as a destination for international students and staff and is based on Bangor University’s numbers of international staff, international students and the level of research conducted in collaboration with international partners. In a world where universities compete to recruit both the best students and the best academics to teach and research at their Universities, Bangor’s reputation as an international University is confirmed by inclusion in this table. “Attracting the best to Bangor provides education and research of high quality and makes a valuable contribution both regionally and on the wider stage,” he added. This top 100 ranking is further evidence of Bangor University’s growing stature nationally and internationally. It follows last month’s endorsement of the University’s research activity in the UK-wide 2014 Research Excellence Framework results which designated three-quarters of Bangor’s research to be either world-leading or internationally excellent. 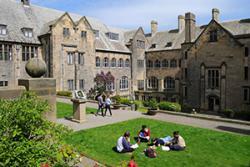 In addition, the 2014 National Student Survey placed Bangor University in the top ten non-specialist universities in the UK, and in number 1 position in Wales, for student satisfaction. The Times and The Sunday Times Good University Guide 2015 also placed the University among the UK’s top 50 Universities.